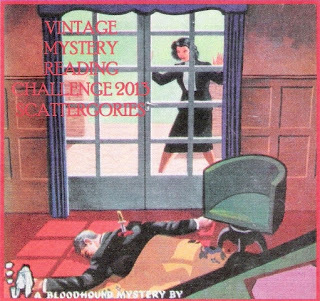 I recently completed the annual Vintage Mystery Reading Challenge at My Reader’s Block! The general goal is to read mysteries published before 1960, and this year’s twist was to fit them within certain pre-arranged categories, à la Scattergories. World Traveler: Patricia Moyes, Dead Men Don’t Ski — Set in the Italian Alps. Repeat Offenders: Georgette Heyer, Death in the Stocks — Because I love me some Heyer! Staging the Crime: Michael Innes, Hamlet, Revenge! — An amateur performance of Hamlet turns deadly. Country House Criminals: Georgette Heyer, Behold, Here’s Poison — I love a good English country house murder! Murder Is Academic: Isaac Asimov, A Whiff of Death — Chemistry professors and their murderous impulses. Yankee Doodle Dandy: Ellery Queen, The Roman Hat Mystery — New York, New York, it’s a hell of a town. Malicious Men: Georgette Heyer, They Found Him Dead — Only male victims in this one! Congratulations on finishing the challenge! What a great bunch of books–I’ve actually read them all…although it’s been a long time since the Asimov book. Might be time for a reread on that one…. Glad you’ll be back for more in 2014! Haha, of course you’ve read them all! I’m definitely looking forward to 2014 and a new crop of vintage mysteries!